Discussion in 'UFOs, Aliens, Monsters, and the Paranormal' started by Mick West, Aug 21, 2015. 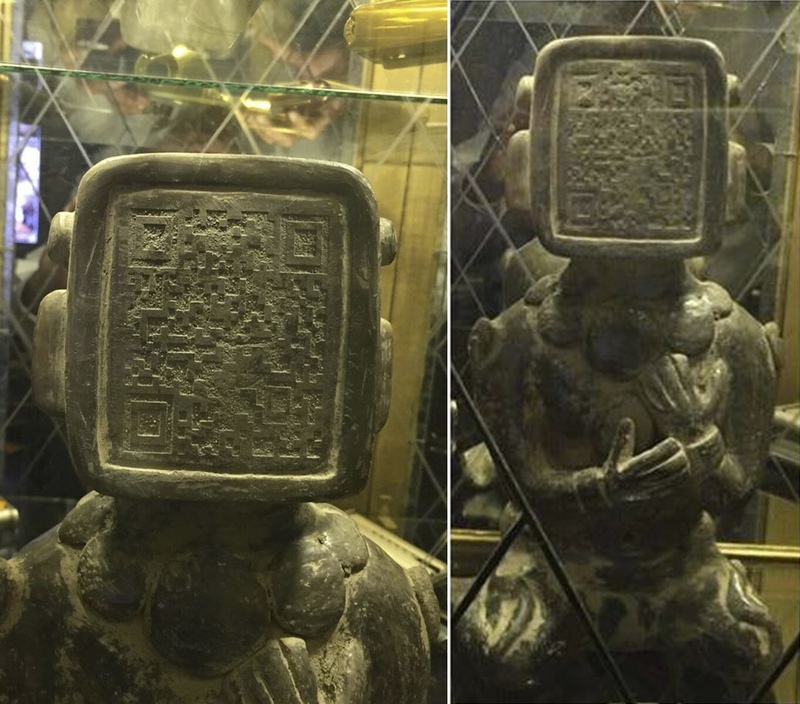 A photo of a statue with what looks like a QR code for a face has been making the rounds on social media, with some of the more imaginative people suggesting that it's evidence of ancient aliens. The "ancient aliens" would also have to be time traveling aliens, as QR codes were only invented in 1994. So the most likely explanation is that it's a modern statue. Either an ironic work of art, or some kind of marketing thing - possibly the company identified in the QR code sponsoring an exhibit. There's been some suggestion that it might be a digital fake, but there's really nothing in the images to suggest it. And note the two images are different, and taken from different distances and angles. The shadow of the head could be interpreted as being too round - but that seems more like an optical illusion with the curve of the large central stone of the necklace continuing the curve. It's always possible that Altech Mexico dates to the time of the Olmec, and the statue is made of near-unworkable diorite instead of locally sourced red sandstone, right? Does anyone speak spanish here? it's also possible it's in the home of the CEO or a board member. They give weird things like that out to company executives and board members all the time. Perhaps someone could write the company and ask. Its a well known fact that Mexico is holding a large amount of Mayan artifacts that are 100% proof that they were made by ancient aliens. This is one of those artifacts. Although the face is a works as a QR code, I doubt the Mayans made it for that. Its probably a mathematical equation to warn about events to come. Oh, and if you didn't know already, aliens can time travel with their ships. "Although the face works as a QR code"!!!? 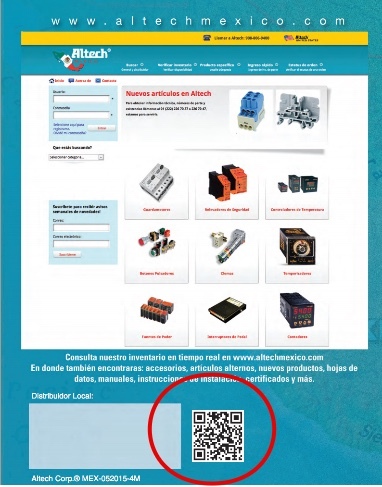 It's the same QR code as is on the back page of Altech Mexico's catalog. possible 30x30 grids (not QR codes, however, since some pixels are taken up by the position and alignment squares, the timing lines, and the version and formatting header areas adjacent to the three big positioning squares) of this type, only one of which matches the QR code on Altech's catalog. So even if the ancient aliens or whatevers were creating a mathematical grid for some reason, the probability of it matching this QR code is 1.18x10^-273%. The probability of it matching ANY QR code is already incredibly small, since even if you match the required pixels not all permutations in those constraints will be valid, and even those that are valid will not all resolve to intelligible text. A single string that will decode into multiple intelligible strings when subjected to different algorithms is one of the holy grails of computer science - they've only been created in trivially small lengths and are mathematically improbable if not impossible for any significant length. IF this is ancient, then the people who created it knew what a QR code would be and knew about this one specifically. I'm pretty sure that guy's just writing weird Star Trek fan fiction at this point. In the final draft, Picard will find the statue in the same cave as the head Data lost in the 18th Century. If not one of you copied the other word for word and is therefore fibbing slightly. I think I can guess which one. Funny, that's a computer voice reading my post (a slightly earlier version). Nothing to do with me. Seems like UFOvni2012 has done this with several videos. yeah I think I found that one too. I still haven;t found the original source of the photo. Scott Waring is "extremely imaginative" is an understatement! But, this could really be what he tends to believe that space aliens are also "time travelers". Accordingly, they would know what they were advertising in the possible marketing campaign? Possibly the space aliens are in the process of cashing in on the future stock market by pumping this Altech Mexico business? They will make big investments and watch their wealth grow. Possibly they were the ones who implanted the idea of using the QR electronic read system into the developer(s) minds. But it really seems like a waste of time travel to do such trivial deeds? When the hoax is completely exposed, if this OP has not already done that? The UFO folks are in for a big disappointment! The statue itself is almost certainly some kind of marketing or a recent work that just used whatever QR code was handy, but the stories being circulated about it online are clearly bunk. UPDATE 3:According to an official of Rede Globo, the matter that "reveals" this mystery will air on Virtual Detective Fantastic, next Sunday, August 30, 2015. ATUALIZAÇÃO 3: Segundo a funcionária da Rede Globo, a matéria que “desvenda” este mistério irá ao ar no Detetive Virtual do Fantástico, no próximo domingo, dia 30 de agosto de 2015. UPDATE 3: According to an official of Rede Globo, the matter that "reveals" this mystery will air on Virtual Detective Fantastic, next Sunday, August 30, 2015. Has anyone tried to scan it with their phone to see if anything comes up? Yes, that was the point of the OP. You can't scan it directly, so I transcribed it. A priceless joke. I think it is also not difficult to photoshop it. FINAL UPDATE: As I said, the statue QR CODE was really a scam and pass the Virtual Detective Fantastic program. It took a while, but went today, just now. As I said, the shadow on the statue's chest was the main factor that gave the assembly. There is a video from the TV program on the page. I don't understand Portuguese, but apparently a computer graphics expert concludes that the photo is fake. The head of the statue is square but its shadow is round. plus, imo, the faux old paint job looks way too "good" to be photoshopped to the body. The paint job isnt actually good, but the match between head and body is good. what do you think @Leifer ? All of that means that the "Fantastico" program didn't do any real research. I mean, cmon, all it takes is for someone to go there and find the statue or talk to the owner of the website the QR code directs to. i did email (although in English) a few contacts from the Altech site, no response though. I dont think you can find the statue as i think its in someones livingroom. <which would make it creepy to give internet people a low down on what it is /where it is... esp if the owner of the statue didnt take the picture. It's always possible to sculpt a fake statue, and paint it to look realistic....even up-close. I do it every-so often for Hollywood. In fact, I painted some tombstones a few weeks ago, for a TV commercial. Before we started, the Director told us, "....he has never seen a realistically painted tombstone", so I took it as a challenge. Message back from the director after the job.....""They looked amazing, they looked real." A few things I see is, you typically would expect more wear....I think the Aztec/Mayan primarily used Basalt stone which pits over time, or ceramics, or some other stone. The QR statue seems polished stone ??. Plus, the QR has way sharper edges than the rest of the sculpture. (possibly carved that way for simply the sake of clarity. I know this to be true....when creating something with a company logo...the paying client wants the logo to be crisp, and obvious.....they are paying for that. In the tombstones we made, the engraved writing was unrealistically "crisp" for their supposed age.. So we gave them.....old tombstones with obvious readable writing. There is a secondary (now upside-down) reflection from the mirror, onto the glass shelf above. It's likely a real....modern advertisement. And I'll admit....kinda clever, from a "buzz" point of view !! But all we have is Mick's HQ photo. i have this pic too but it just makes it more confusing because i cant tell what the statue is straddling.. or how that could be a base. The fun of working in a model/prop shop....We've been known to cut the heads of plaster statues, and replace it with a custom-carved "celebrity" head.....then it all gets painted to match......and become lawn-art, or whatever. Or in this case, we could have taken an imitation sculpture, and added the QR face, and paint it to match. So, did you get to actually meet Richard Simmons?! ?